Will try to debug it somehow. How many seconds are "few seconds"? Do you do something "user interaction"-wise? Defaulting to PulseAudio might lead to crash on distributions not having PulseAudio installed - at least it happened that way for my game TVTower on "Knoppix" and another Linux distribution. [21:25:03] ERR | SOUNDMANAGER.SETAUDIOENGINE(): audio engine "AUTOMATIC" (configured) failed. [21:25:03] DBG | SOUNDMANAGER.SETAUDIOENGINE(): initialized with engine "LINUX_PULSE". So "auto" failed (Alsa) and it tried LINUX_PULSE then. If it used eg. "Alsa" (which would work on your distribution too) then you might experience odd things: it works if no other sound source is playing (browser with youtube, internet radio ...). Might be the reason why many use OpenAL to tackle all these problems. On Windows that means to provide an additional .dll file and maybe some more little annoyancies. Hmm you do not seem to do something special. And if it was something special then it would not explain why it crashes on Xerras Mac too (except he does the special thing too ... which I doubt). I think it also crashes on "skirmish" or so - so nothing "campaign specific" (introduction screens were shown - and from then on nothing should differ to a random/skirmish game). Muting the music won't fix it too (I think). I assume it is an issue with my old XCode and your newer Mac. Maybe Brucey or another NG user can compile on a newer Mac OS (make sure to update BCC/BMK and the brl/pub/sdl modules if you use the 0.99 mac release). Well there's not a huge amount of people with Linux on here, so if they have a problem with sound then we have a solution with a quick config edit. ok I see what you mean, after using LINUX_PULSE in settings that made youtube videos sound awful. So use one setting on start up and switch on program exit? That's what I did manually to get Youtube sound back. So use one setting on start up and switch on program exit? Hmmm, what should that do on program exit? Did not really get it. Sound on Linux always was a bit of an issue (for me). PulseAudio changed a lot already (hot switching to bluetooth output, hdmi instead of soundcard etc.). Dunno how it is with AGK (and others). Maybe they tackle it different to me (using "rtAudio" via maxmod2.mod). Aside of the audio discussion here I am not against reading some feedback or other (solveable! :-) bug reports. Sound on Linux always was a bit of an issue (for me). As a Linux newcomer I think sound is a major problem and lags behind the rest of the OS, which is very nice. I had to change sound settings in your game, and then back again to regain (undistorted) Youtube sound. Some experimentation for later, it seems you have bigger problems on Mac to sort. I can get the game to run without crashing on Linux. 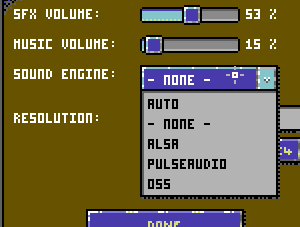 I compiled a new version - which should allow to not initialize the sound engine at all and to make it configurable via GUI. if settings.xml contains audio_engine="NONE" then it _should_ avoid to init the audio engine at all. Nonetheless I would wonder if it was rtAudio - as the "main screen" already uses it ... so it should crash there too. But hey, better test that out than nothing. Original Download is left intact (just in case someone says that the GUI option addition is against the rules). Yes that latest version solved all problems on default settings. The game has sound, and after quitting it doesn't effect You Tube Videos. What we need is a language that runs on WIndows, Mac and Linux. But perfectly. Sounds like a cool theme for the next competition?